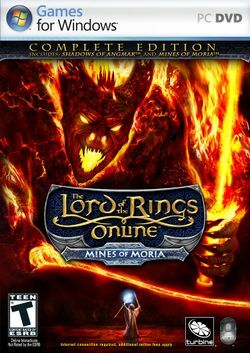 The Lord of the Rings Online: Mines of Moria is the first retail expansion pack for the MMORPG The Lord of the Rings Online: Shadows of Angmar and was released on November 18, 2008. It was announced on March 14, 2008 at Codemasters Online Connect 2008. A promotional "complete" edition of the game was given out at PAX Prime in 2009. This edition included DVDs containing the game's installation files, as well as a basic manual, serial keys for friends, a sweepstakes entry code to win "$25,000 in prize", a promotional poster, and a poster-sized map of Middle Earth. The storyline is set in Moria, an enormous underground complex in north-western Middle-earth. Apart from that, the expansion also adds the regions Eregion and Lórien. The game's level cap has been increased to level 60; and the expansion (also called "Volume II") extends the epic storyline by six more books, and adds two new classes, the Rune-keeper and the Warden. Other new features include environment aware AI, dynamic lighting, and a new weapon enhancement system. Promotional box cover (front, side, and back). Serial key pamphlet's front and back cover art. Poster featuring the infamous Balrog vs. Gandalf scene. Siege of Mirkwood flyer, front. Siege of Mirkwood flyer, rear. This page was last edited on 28 May 2014, at 03:19.